Posted on January 16, 2014 by Wild Cookery! Deane over at Eat the Weeds posted this today, in which the book is reviewed by Mark Sisson. It isn’t often that I write book reviews (have I ever? – serious question), but it isn’t often that a truly important book like Lierre Keith’s The Vegetarian Myth pops up on my radar just begging for one. You may remember it from a brief mention I gave back in September, or maybe from Dr. Eades’ endorsement of it. You may have even already read the book yourself. If you haven’t, read it. And if you have? Read it again or get one for a friend. That goes double for vegans, vegetarians, or anyone on the cusp of adopting that lifestyle. If you fit the bill, especially if you’re considering veganism/vegetarianism for moral reasons, drop what you’re doing and run to the nearest bookstore to buy this book. It’s incredibly well-written, and the author has a real knack for engaging prose, but that’s not the main reason for my endorsement. The real draw is the dual (not dueling) narratives: the transformation of a physically broken moral vegetarian into a healthier moral meat eater; and the destructive force of industrial agriculture. The “Myth” in question is the widely-held notion that vegetarianism is the best thing for our health and for our planet. On the contrary, Keith asserts that a global shift toward vegetarianism would be the absolute worst move possible. It’s vitally important. It’s definitive. It’s somewhat depressing, and it’s brutally honest. It also might be the book that changes your life. Lierre Keith is a former vegan/vegetarian who bowed out after twenty long years of poor health and paralyzing moral paradoxes. Her original goal was to explore the question, “Life or death?” as it pertained to food. She, like most vegetarians, assumed she had a choice between the two, that it was an either/or thing. Eating tofu and beans was life, while a burger represented death. Life didn’t have to involve death – that was the weak way out, and the honorable (and difficult, and therefore meaningful) way to live was by avoiding animal products of all kinds. No blood on your hands or on your plate meant a clean moral slate. Or so she thought. See, Keith began as a moral vegetarian. She never espoused the idea that meat was inherently unhealthy or physically damaging; she was simply a young kid who “cried for Iron Eyes Cody, longed… for an unmolested continent of rivers and marshes, birds and fish.” We’ve all heard of kids who “turn vegetarian” when they find out their chicken nuggets once walked, clucked, and pecked. Well, Keith was that five year old who bemoaned the “asphalt inferno of suburban sprawl” as a harbinger of “the destruction of [her] planet.” Hers was a deep-seated commitment to the preservation of all living things, not just the cute and fuzzy ones. That expansive scope meant she looked at the big picture, and suffered for it. She never got to enjoy that oh-so-common smug vegetarian elitism, because she was too aware. Seeds were living things, too. They may not have had faces or doting mothers, but they were alive, and that meant they could die. Killing slugs in her garden was impossible, and deciding whether to supplement the soil with actual bone meal was excruciating. Unlike most of her peers, she knew that avoiding direct animal products didn’t mean her hands were clean. They might not be dripping red, but living organisms died to make that head of lettuce possible. Fields were tilled and billions of microorganisms were destroyed, not to mention the mice, rabbits, and other wild animals whose environments are leveled to make way for industrial farming. And so whichever direction she went – home gardening, local produce, or grocery store goods – Keith was contributing directly and indirectly to death. What’s a moral vegetarian to do? She briefly entertains studying with a mystic breatharian, hoping to (tongue-in-cheekily) learn to subsist purely on oxygen. She spends hours picking slugs from her garden and goes to relocate them. Nothing works. She keeps coming back to death. “Let me live without harm to others. Let my life be possible without death.” Keith realizes this vegetarian plea (which “borders on a prayer”) is impossible to fulfill. She can’t live and eat without something dying, and that’s the whole point of it all. Death is necessary and natural. Circle of life, you know? Without death of some sort, life would get a whole lot worse. Keith ultimately sets her sights on one of our favorite human “advancements” at the Apple: agriculture! Readers of MDA already know how agriculture altered our trajectory forever, but maybe not in such vivid detail. We focus on the lowered life expectancy, reduced bone density, compromised dental health, and the stooped, shrunken skeletons of our Neolithic ancestors, but Keith shows how grain agriculture actually destroys the land it touches. The Fertile Crescent, ground zero for grain development, used to be, well, fertile. It was verdant, lush, and teeming with life – including nomadic hunter gatherers. Paradise, you might even say. Animals grazed on perennial grasses, pooped out nutrients, and gradually those nutrients would work themselves back into the soil. It was a beautiful, natural life cycle that worked great for millennia. But once grains were grown and the land was irrigated, everything changed. Perennial renewable grasses became annual grains. Animals no longer grazed and replenished the soil. The top soil was robbed of nutrients and faded away. Irrigation meant crucial annual floods were disrupted or even halted. A massive monkey wrench was thrown into the system, and rather than coexisting as a complementary aspect of nature, man thus commenced the conflict with the natural world that rages to this very day. And that’s the crux of her argument – that modern industrial agriculture is wanton destruction. Grain-based, vegetarian agriculture is even worse, because it attempts to eliminate a crucial player in the normal life cycle of the planet. Animals, which provide manure, calcium, and other nutrients for the soil, have to be part of the equation. Whenever a culture turns to a grain-based agricultural system, these same problems arise. Annual grain crops killed the American prairie and, for the vegans out there, they kill the millions of animals, bugs, and birds that rely on specific ecosystems to survive. The vegan’s soy burger has nary an animal part, but the machines that worked the soybean fields were greased with the blood of a thousand organisms. The vegetarian’s wheat crops feed millions, but robs the land of nutrients and destroys the top soil necessary for life. Primal readers won’t be surprised by what they read. They may be horrified at the extent of the environmental damage caused by industrial agriculture, but they won’t be surprised (given agriculture’s poor track record with our health). Keith lays out an effective case against grains (and for a Primal-ish, low-carb, high-fat diet, believe it or not) on nutritive, moral, and economical grounds that’s tough to refute. The nutritional information will come as second nature, but the sources are sound and the references are powerful. There’s more, far more, but I’d rather not spoil the entire thing. Just read it and rest assured that it’s worth your time. The book is a must-read, and a great ally for anyone interested in promoting a healthy, sustainable, omnivorous future. Read this book and distribute it to your vegan friends. I’m ordering this book today. I know just who to give it to! Posted on June 27, 2013 by Wild Cookery! A significant change is coming soon to Wild Cookery! Yes, we’ll continue to be about foraging and cooking up all things delicious and wild. But we’ll be adding to our ‘menu’ so to speak. In the past, there have been various other topics covered here, but I still strove to keep it focused primarily on foraging topics and the cooking of wild foods. Times have changed. We’re going to be going a bit more ‘broad spectrum’ instead of ‘highly focused’. There is a very important reason for this…Everything is interconnected. The audience for a 100% foraging focus is very slim indeed. In fact most people who prepare for other things unfortunately have learning foraging on the bottom of their list. I mean to change that through cross-exposure by discussing other topics that are important to people. I’ve heard it many times that I should keep Wild Cookery! strictly about foraging, to the exclusion of most other topics. I disagree. Foraging is very interconnected to many other things. Or rather, a ‘lack’ of foraging is. Because most of us no longer forage for our food, we are very disconnected from nature. Nature is something which, to us, exists in isolation of, and removal from, the human condition. By encouraging discussion of other somewhat related topics, we will segue into discussion of foraging with people that would otherwise have not sought out information on foraging. We will reach a much higher number of people than we ever would just by continuing to endlessly ‘preach to the choir’. The more good people who know the basic skills of foraging, the better off the whole of humanity is. And no worries, we all know that the number of foragers will never exceed a fractional percentage of the population. So fears that people will ‘over forage’ the world en masse if ‘everyone’ knows this knowledge are statistically unrealistic to the extreme. So, fear not. You aren’t going to be training your competition if you teach a few more good folks how to forage. There are many valid topics in these tumultuous times that deserve in depth discussion. If all I do is talk about foraging, then the many and varied topics of our time that need to be talked about get completely missed. I think this is a disservice. I also think that most of the foragers I know personally will applaud this move, as the vast majority of them are very intelligent and dynamic people. They have wide and varied interests. In other words, they aren’t just interested in foraging. They’re interested in what’s going on in their world and how to make a positive difference. They also don’t oft get a chance to discuss these topics as they are afraid to talk about them in other places for fear of being ‘off topic’, or considered ‘fringe’. I would like this blog, and the corresponding Wild Cookery! Forums to eventually become such a springboard for open and honest discussions. All legal and lawful topics should be up for discussion in a healthy society. A mutual interest in foraging should be the start of an intelligent conversation, not the end all be all of a conversation. Posted on June 21, 2013 by Wild Cookery! Everyone knows that high cholesterol and eating saturated fat cause heart disease, right? Just ask almost anyone. Ask your friends, co-workers, parents, siblings, neighbors, and medical ‘professionals’. They’ll likely all tell you that, yes, saturated fat is the prime cause of heart disease, and eating a bacon cheeseburger is a heart attack waiting to happen! It’ll raise your cholesterol, and then you’re just moments away from a fatal myocardial infarction. The conventional wisdom is that the 3 B’s of ‘Butter, Bacon, and Bovine’ will be the death of you! It’s enshrined dogma now. It doesn’t matter one lick whether or not any of it is true or not. Or if in fact, it’s just absolutely and totally 100% pure bullchips. It’s engrained in the public consciousness now. It’s now ‘fact’, even though it’s absolutely and patently false. To answer this, we must take a look at cholesterol. Cholesterol is a very misunderstood thing, even by many very educated people. Most doctors I know do not even understand it. You try to have a simple conversation with them and most of them look at you like you’re crazy. The fault does not lie with them, per se. They are just perpetuating the myth and regurgitating what they were taught from rote memorization. I do not think that this is by accident. Just like there is no profit in ‘cures’ for anything, but rather in the treatment of ‘disease’, there is no profit in an educated public. The individual doctors are not to blame. But they do have some responsibility to bear for continuing to be the banner men and women for something that was long ago proven to be flat out incorrect. The confusion in all of this comes with LDL, or Low Density Lipoproteins. When your LDL level goes up, everyone freaks out. This is the ‘high cholesterol’ that your doctor typically talks about. High cholesterol isn’t the problem. It’s the symptom. You don’t fix something by absolutely ignoring the cause and trying to ‘fix’ the symptoms instead. But that’s exactly what the medical industry does at large. (Because it’s not really trying to ‘fix’ anything!) In order to address the cause, we must first ask why the cholesterol is elevated in the first place. In other words, what function does it serve that is causing your body to have this response? The answers may prove instructive. It is also important to note that most of the time when someone goes in for a cholesterol test, that the office doing the test largely do not inform you of the difference between LDL and HDL (High Density Lipoproteins) They just say you have high cholesterol and that you have to bring it down. If you don’t ask, they typically won’t even tell you which of your cholesterols are high. As everyone knows, LDL is labelled as ‘bad’ cholesterol. It’s not ‘bad’, it has a function in your body, and is there for a reason. Bringing your LDL way down is just as dangerous as having it be too high. Your body needs it’s cholesterol. Without cholesterol, you’d be dead as a doornail, as your cells would not heal themselves or replicate. They also do not typically test for LDL particle size. It’s the smaller ones that tend to get ‘stuck’ in places where you don’t want them to be and eventually cause a build up if there are too many of them. And they get stuck there in the first place because they’re doing what they’re designed to do, and that’s repair damage. Statins are the world’s most-prescribed class of medications. A staggering one in four Americans over the age of 45 now take cholesterol-lowering drugs such as Pravachol, Mevacor, Lipitor, Zocor, Crestor, and others. A majority of them are taking these drugs for primary prevention of heart attacks and strokes. However, mounting research suggests this could be a critical mistake. Most recently, two separate studies have concluded that progression of coronary artery calcification, which is the hallmark of potentially lethal heart disease, is INCREASED with statin drug use. The pharmaceutical powers that be of Big Pharma and Big Medica want you to be mostly ignorant of cholesterol. They want you to think of all of it as ‘bad’, so that you’ll buy more of their statin drugs and pad the bottom line. And why shouldn’t they? They’re a business. It’s called the medical industry after all. It’s a for-profit organization, not a philanthropic braintrust. They want to sell more statins. You are a consumer to them, and you need to be as ignorant as possible to consume as much of their product as they can possibly sell you. But wait, you say. My Dr. says that I need to lower my cholesterol! How can I do that without statins? Here’s a real question that folks need to pose to their doctor. “Why do I need to lower my cholesterol?” So many people I know are afraid to question their primary care providers and ask the simple and basic questions. They think that they’ll look like a fool, or a weirdo, or whatever, if they simply ask the doctor questions that challenge their recommendations. Almost as dangerous as the totally ignorant, are those who are just educated enough on a certain topic to be intolerant of any other view. These doctors largely fall into that category. I refer to these folks as having a ‘militant mindset’. Whether that be in regards to science, beliefs, religion, politics, or their diet. They get a certain mindset and become very rigid, often ignoring and failing to incorporate any further research into these topics. They also do not tend to research the topics very well at all. But they don’t need to be a doctor to have this mindset. Your average Joe or Jane has it as well. They’ll just order one book on something and all of a sudden they’re an ‘instant expert’, and look down their snout at anyone who doesn’t toe the line 100% in accordance with their current beliefs. Which may change with the next new and hot ‘trend’. On the flip side most of our doctors tend to be mired in the quicksand of the dinosaur age dogma of rabid Keysism. It’s only through a small number of medical practitioners who are fed up with nearly half a century of bad medical science, and with an informed and proactive cadre of individuals that are taking their health into their own capable hands, that any of this information is surfacing at all. If it were up to the mainstream medical mafia, none of it would ever see the light of day in a million years. The purpose of this article isn’t to give you all the answers. It is to get you looking for answers of your own. There are also things that all of us need to be aware of that will affect each and every one us, such as the new ruling by the AMA that declares obesity as a ‘disease’. Be on the lookout for all the new and invasive ways that they try to control our lives in order to combat this newly classified ‘disease’. The effects will be as far reaching as they are detrimental. And what will the medical mafia recommend as a solution to this new ‘disease’? More of the same that got us there in the first place! Low fat, high carb, diets with plenty of grains. That’s what they’ll recommend. And that’s what’s been killing us for decades. Oh, and exercise. You can’t forget that one. Just burn more calories than you take in, and you’ll lose weight, right? What a joke. You’ll never exercise yourself from obese to thin. And nothing positive will happen if you don’t get your sugar and carb intake under control. It’s simply not physically possible. Since obesity is now classified as a ‘disease’, I guess folks like me better watch ourselves and protect every simple truthful statement we utter with a disclaimer. You know, because only the FDA is allowed to say what can and cannot be used to prevent or treat a ‘disease’. So saying something so simple as ‘Excess sugars and carbs can make you fat’ would be a borderline revolutionary statement now. Well, you know what I think about that? Posted on June 20, 2013 by Wild Cookery! Posted on June 18, 2013 by Wild Cookery! This series will take a look at what I consider to be many of the modern misconceptions about nutrition, cholesterol, and what really is and is not ‘bad’ for us in regards to our diets. The common and pervading wisdom is that a ‘low fat, low protein, high carb diet’ is ‘good’ for us. 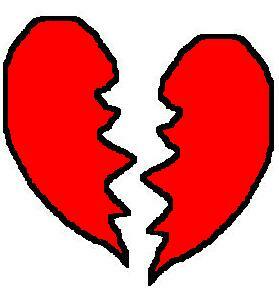 Meats and animal fats, and dairy fats, are all demonized as horrendously ‘bad’ for you and ‘heart breakers’. So let me get this straight… we are told that the healthy fats that mankind has eaten for hundreds of thousands of years (or more), are actually ‘bad’ for us, and the fakey chemically extracted stuff that tends to mostly be in processed foods, are good for us. In other words, don’t eat eggs, because they’re ‘bad’ (again), and don’t eat butter because it’s bad, eat more margarine with vegetable oil in it instead. Like corn oil, for example. As stated in the movie ‘Fat Head’, when you press corn, you don’t get corn oil. It has to be chemically extracted. It’s an aberration of nature. Is such a thing truly ‘good’ for us? I don’t think it is. But who’s the pusher of this particular brand of nonsense? None other than the American Heart Association. A recent visit to their site was eye opening, to say the least. But not for the reasons you may think. Naïve type. Yea, that about sums it up. You’d have to be pretty naïve to believe these people to begin with considering the line of bull they’re spreading. 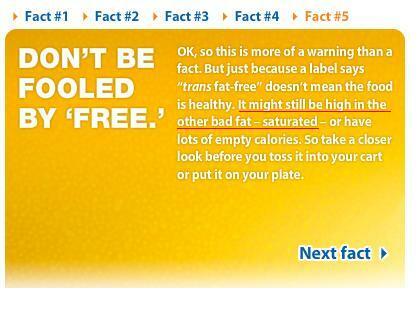 Now, I’ll be the first to admit that anything with trans fats in it is bad news. 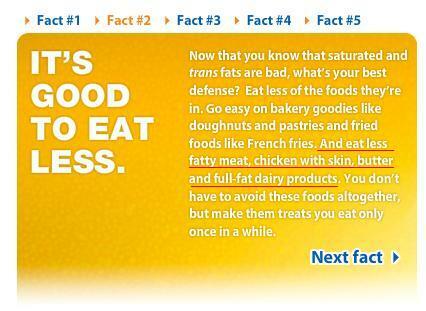 But they lump saturated fat and trans fat together as the ‘bad fat brothers’. This is incredibly misleading. Find me ONE reliable study that proves that saturated fat is bad for you. But don’t hurt yourself searching too hard… you won’t find one. All the data points to the exact opposite. That your body NEEDS saturated fat, and a diet that is high in saturated fat is actually GOOD for you. Anyone who’s done a shred of research knows that it’s not fat that turns into fat in your body. The fat is absorbed much slower and has a chance to be burned off as energy. It’s the sugars and carbs that get turned into fat from the action of the insulin response. You eat sugars or carbs, your sugar level spikes, and your body produces insulin and converts it into fat. These idiots actually say that Canola oil is ‘healthy’ for you. Uhh… Whiskey, Tango, Foxtrot, over? Canola oil is one of the worst things you can cook with, especially as it is a carcinogen when aerosolized under high heat. Also, the site has Canola manufacturers and such as sponsors. Hmm. Not a conflict of interests there, is there? Kind of like McDonalds supporting a study that says fast food is good for you. You’d never believe it in a million years would you? Of course not. But yet millions believe what the AHA has to say as though it’s the word of God. Well that’s not too far off, because it’s certainly enshrined and entrenched dogma, that’s for sure. But what really ticked me off are the following ‘facts’ that they have on their site. A fact is something that is proven. A fact is not a theory or hypothesis. One flawed and cherry picked study by Ancel Keys does not a fact make! Text underlined by me to highlight a point in each image. Let’s take a look at the first one, shall we? 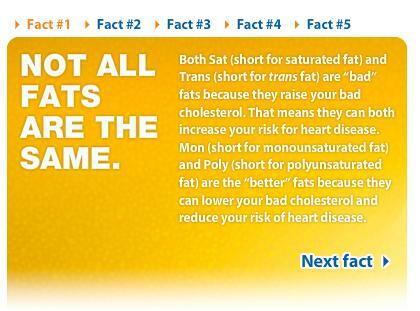 Here it demonizes saturated fat as a ‘bad’ fat. Really? And why is that? It’s not a fact, it’s an opinion. And an incredibly flawed one at that. In the next image, it proceeds with the assumption that you are now properly schooled on the ‘fact’ that saturated fats are bad, and thus urges you to eat less fatty meat. Chicken with the skin on, butter, and full fat dairy products. You know, the things which are actually healthy for you. 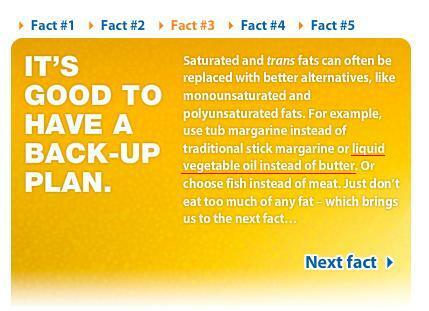 Next, it urges us to use liquid vegetable oil (such as canola, soy, etc…) instead of butter. The only way this would be acceptable on any level is if it was virgin pressed olive oil. But I solve that problem. I use BOTH butter AND olive oil! Yum! I lost 60 pounds doing almost nothing. All I did was cut the sugars out of my diet, and ratcheted down on the carbs. I ate meats and fats and butter and olive oil and eggs like they were going out of style. I was taking in thousands of calories a day, and yet was chained to a desk for my job most of the time. I did a very little minor walking here and there. In the morning I did a set of push ups every other day or so. That’s about the extend of my physical exertion. And I lost 60 pounds sitting on my rear. So much for that little so called ‘fact’ about calories in, calories out, eh? Last is yet another warning about saturated fats. That’s funny. As I stated above, I lost 60 pounds eating a very heavily saturated fat diet, and all things considered, felt pretty good. The problem is that all of this flawed research is now very deeply entrenched dogma. History shows that the only time such things change is when the baton is passed to a new generation who does not share the previous generation’s prejudices or mindset. Such is the case here. Nothing will change in the industry until those who are in high positions and keep pushing these lies retire, or kick off from following their own flawed and scientifically unsound advice. Thus, any real change, may be many decades off. Posted on June 11, 2013 by Wild Cookery! I’d like to introduce my new comic strip, “The World According to Bob.” It will cover the perspectives and adventures of one ‘Robert Joe American’, known as simply ‘Bob’ to his friends. Post Scriptum: Sugar hasn’t actually been banned. Yet. Posted on June 10, 2013 by Wild Cookery! For this installment, I’m going to focus primarily on obesity and it’s effect on the health of our nation. Back in the early 1980’s obesity was about 15% in America. Now it’s about 34%. Diabetes has also tripled in 30 years. There are also 30% more obese than undernourished people worldwide, according to the WHO. In addition, five percent of the world’s total population is diabetic. Does anyone think this is a problem? What changed, in just the last 30 or so years? And just as importantly, how can we fix it? There are many different facets of these problems, and many different views. There seem to be a few differing schools of thought in regard to how we go about addressing these problems, and it’s approached by two primarily different viewpoints. First are those who see obese people as perpetual ‘victims’. They tend to feel that it is society’s responsibility to fix the problem, and that the individual is just a helpless and powerless victim in the matter. Alternately there are those who feel that it’s an individual’s responsibility to change what needs to be changed. The two mindsets oft do not mesh. But I do think that we may be able to reach a happy middle ground in order to actually break ground on a solution. If there is to be any solution at all, we have to reach a compromise and ultimately agree that the past is irrelevant as to who’s fault it was, and that the thing to do now is to move forward with dynamic and factual solutions instead of get wrapped around emotional arguments of who or what is ultimately responsible. Ergo, we could argue endlessly whether or not it’s the obese individual’s responsibility whether they’re obese or not, but at the end of the day, nothing changes. They don’t get any less obese, and nothing is solved. We also haven’t had much luck going directly to the people and talking to them about this on a national scale. They largely do not care, even though it’s affecting them and their loved ones profoundly. As Dr. John Lustig has quoted, “No amount of public education can fix this problem.” By this, he means that it requires government intervention. A doubled edged sword if there ever was one. As of 2001, six million children in America were overweight. Fast forward to 2013. We are now at 20 million overweight children. Everywhere you look, children are unhealthily overweight. Even the basic sizes of children’s clothes take this into effect. For example, a size 6T shirt of today is actually larger than a size 6T shirt of 10 years ago. Why? Children have gotten fatter. But it’s not just children. Adult Jeans aren’t straight up and down anymore, they’re flared at the hips. Why? We’ve also gotten fatter. I used to by XL t-shirts and sweat shirts. Now I have to buy a M or L, because the other size is so big I can fit two of me in them. I compared two size XL shirts, one newer and one older, ostensibly of the same size, and the newer one I bought in 2008 is gigantic compared to the older one I bought back in 1999. But the plagues that are Obesity, Welfare, and what I call the ‘Health Epidemic’, which includes rampant type II diabetes (especially in children), hypertension, lipid problems, heart disease, etc, are all intricately linked in the same web. Though obesity could definitely be included in the ‘Health Epidemic’, it is more a symptom of the Health Epidemic. It’s the result OF the Health Epidemic. People aren’t getting fat because they’re eating to much. They’re eating too much because they’re getting fat. Obesity is just a symptom of all these other problems, not the cause of them. It is because this is so widely misunderstand in the health community that obesity has been getting worse for 30 years instead of better. As a society we’ve got it entirely backwards, which is why we fail to succeed on all of these ‘diets’. But what diets actually do work? Diets which are low in sugars, (usually) low in carbs, and high in fats. But these aren’t short term things in which you can just go on for a few weeks to lose a few pounds and then go back to eating plates full of cheesecake all day. If you want to be healthier, you have to understand what causes obesity in the first place, and make the requisite lifestyle changes. We have to look at this obesity epidemic with an eye towards actually solving it. We can’t be afraid to call a spade a spade. In my opinion considering these people perpetual ‘victims’ will not solve anything. Unless these people who are obese, want to change it, and seek to find answers of their own accord, then nothing will change at all. Some magic legislation is not going to be passed that will all of a sudden drastically alter their intake of carbs and sugars. Whilst I agree with folks like Dr. Lustig that it goes ‘way beyond personal responsibility’ for the causes of obesity, personal responsibility is probably the only place we’ll ever find a solution to it. If a solution is forced upon people, even if you could ever get it to pass muster and be put into law, people will resist it. They’ll cling onto their HFCS and sugar and loudly and proudly beat their fat-laden chests and declare how you are violating their ‘rights’. These people are addicted to the sugar and the carbs. I’ve had a few very obese friends in my life and cutting out sugar for them is pure torture. They always, invariably, go back to it. They can’t help it. They need their ‘fix’. An addict will always get their fix, no matter what they have to do. Whilst an obese 6 year old can’t take responsibility for their condition, and change their diet, their parents sure can. And I’m seeing a lot more obese 60-year-olds than obese 6-year-olds in my particular local area. Adults can no longer afford to make endless excuses and point fingers at other external forces for their conditions. It is true that we’ve been given a raw deal and had the wool pulled over our eyes and the rug pulled out from under our feet. But complaining about it and taking on an “I’m the helpless victim here.”kind of mentality will never bring any solutions to this problem. We need to trudge forward despite having been victimized en masse as a society. The time for the pity party, is over. We, one by one, need to make a change. We need to do it for ourselves, and for the future generations. We need to find a solution to this problem, and not simply pass the buck to our children and grandchildren. However, we can’t make anyone change their eating habits, just like we can’t make anyone exercise. They’ll resist and hate you for it if you try to force them to do it. This is why even if we could pass legislation, simply outlawing sugar or HFCS wouldn’t work. Such an effort would be pointless, and fail utterly. It would just crop up on the black market and create a new and lucrative product for entrepreneurs. Likewise, public education campaigns typically fail horribly. “Just say no to drugs.” Remember that? It worked beautifully, didn’t it? Because most people who were using drugs, just stopped using drugs after that campaign, right? Wrong. It didn’t do a darn thing other than waste a huge amount of our tax dollars. It is true that overall drug use did decline during the years of the Reagan administration, but it sure the heck wasn’t from the kitschy phrase ‘Just Say No’. The decline in the use of recreational drugs can largely be attributed to an overall and increased general prosperity during that time period. When people are more prosperous, they tend to need less of an escape from their daily lives. Now, what about exercise? Isn’t obesity caused by people taking in more calories than what they’re burning? Isn’t a calorie just a calorie, as my doctor says it is? No. 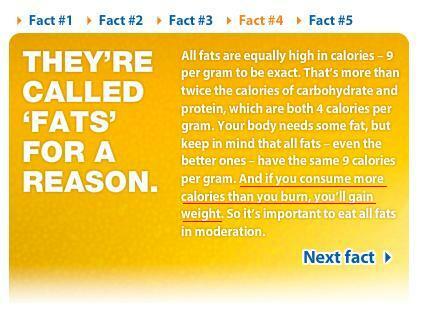 A calorie is NOT a calorie. A calorie from an apple, or a piece of meat is NOT the same as a calorie from a piece of cheesecake. Your body utilizes and stores differently, the compounds in these foods. In the cheesecake, you’ve got carbohydrates and fructose in the same place. In nature such a thing does not exist. In the apple, the sugars exist with fiber, which means you can eat it without much of an issue. Eating an apple a day will not make you obese. The meat has protein and fat, which is not a problem at all. This is what your body runs best on. Fat does NOT make you fat. Sugars and carbs do. Fat burns off and is used as the preferred fuel by our bodies. Exercise of some sort is important in an overall health plan, but honestly you could fix most of what’s wrong with you without doing a single sit up or push up. I lost 60 pounds just by drastically reducing the amount of sugars and carbs in my diet. Though I would indeed suggest at least walking a little bit each day. We’re designed for a lot of low stress, low speed movement most of the time. But make no mistake, you aren’t going to exercise your way to fitness, much less whilst eating all the wrong things. People have been trying this on the advice of their doctors for the past 30 years, and guess what? People are working their butts off in the gym, and still getting fatter. Sedentary behavior is not to blame for the obesity epidemic. Likewise, people can be obese, and very active, and still be very obese. Take seasonal farm workers, for example. Many of them are quite fat and work extremely hard, many hours a day of physical labor. And yet, they are still in very poor health. You cannot ‘exercise’ your way to good health if your diet continues to be poor. So how do we fix this? Can we even fix it? Is it the responsibility of the individual or of the society as a whole to fix this problem of obesity? I don’t think it really matters who’s ‘responsibility’ it is, but rather, what will actually work. Being an advocate of rightful liberty, my gut would tell me that this is absolutely an individual problem. People do need to take responsibility for their health and diet. Who else is going to possibly do it for them? Who’s going to fix it then? Politicians? The people in power will NEVER let it happen. They’d lose a huge chunk of their power, voting bloc, and easy votes. More healthy people, means they’re needed less to lobby to pit people against each other and pit the younger generations vs older generations on such things as Social Security, Medicare, and Welfare. Societal intervention as a grass roots movement would be great. But it’s not going to happen of it’s own accord. In order for a change to ever happen outside of the individual level it would have to occur at some kind of governmental level or the food industry would have to make voluntary labeling changes. We all know hat’s not going to happen willingly. It would have to be forced. Companies need to disclose EXACTLY what is in their products. How much added sugar, along with is it or is it not GMO, etc. Once people are informed, they can then begin to take personal responsibility and make better individual choices for themselves. So who can do that? The Executive and Legislative branches of government aren’t going to touch this with a ten foot pole due to the campaign donations and the influence of the food industry. They’re largely bought off already, and have been for a long time. They also like us fat, dumb, and diseased. It keeps them in power, and keeps the votes and money coming in to support their endless problem, reaction, solution paradigm. Which works as follows: First, create the problem, then wait for the reaction of the public demanding that ‘something’ be done, and then present the so called pre-planned and prepackaged ‘solution’ that the people demand. All whilst traveling further down the spiral and actually not fixing a darn thing, but whilst taking away even more of our health, wealth, and freedoms. This leaves us with only one lawful option left. The Judicial Branch. The only way this is going to go anywhere is if it is raised as an issue before the Supreme Court, and fructose is heavily regulated. At the very least, labeling of added sugars must be added to the ingredient labels so people will be able to see what’s really going on with the food they eat. Then and only then will the obesity and health epidemics start to slowly reverse itself. And it would take a truly grass roots movement to get it there before the Supreme Court in the first place. Assuming, of course, that they aren’t bought and paid for as well. They very well could be. I’ve seen some very strange rulings come out of there. When the highest court in the land is highly divided on what should be a pathetically simple question of what is, and what is not Constitutional, you have a very large problem. Nothing should EVER come down to a 5/4 ruling. That smacks absolutely and completely of sheer political horsepuckery. They are supposed to be the best justices in the land, and we’re expected to believe that half of them have no idea, on a regular basis, of what is and what is not lawful under the supreme law of the land? Bullchips. And if they are totally bought and paid for… well… then that’s that. Do I blame the obese individual for being obese? No. But I do hold them responsible. In the end, we have only our personal responsibility. We cannot control others. We cannot bend or mold them to our will. We cannot coerce them or force them to behave a certain way, and we cannot legislate our way out of obesity. No one is going to rescue us from ourselves. If anything is going to ever change on this front, we will need to ultimately make the changes that we’d like to see. We’ll need to step up and be the change we’d like to see. And that requires us to see ourselves as empowered individuals, not as helpless victims. The time for somnambulism is over. If you’d like to know more about how we got to these epidemics, here’s a few good places to start. Posted on June 6, 2013 by Wild Cookery! Waiting in the grocery checkout line and looking into someone else’s shopping cart and seeing a load of GMOs and prepackaged processed toxin-laden crap in there from bottom to top, does tend to bring forth a bit of righteous judgment from my family. Is there any wonder that little Timmy is wearing clothes 4 sizes bigger than he should be? What are you feeding him? Bread with HFCS and soy lecithin in it, ‘fruit’ drinks that are mostly sugar and corn syrup, frozen pizza with gods know what in it, chips, soda, the worst possible quality of lunchmeat you can find (also with soy and HFCS), and a case of fluoridated and chlorinated ‘water’. Oh yum. I don’t call the people out on it of course. I do maintain at least a shallow veneer of social politeness. I have no problem if people wish to slow kill themselves. I just wish they’d stop doing it on my tax dollar. There’s only so much ‘passing the buck’ that can go on, for so long. Yes, the government and corporations promoted this stuff about carbs being good and all fats being bad, and pushing for HFCS to be in nearly everything, and told us all bold faced blatant lies about it. So what? How is that any different than anything ELSE the government and corporations do? All they DO is lie. All the time! 24/7/365 pure unadulterated BS. All the time, all channels, all stations, all languages. If I ever heard a word of truth from any of them I think I’d keel over from the shock! So it’s not like this is exactly unexpected. Not unless someone is so totally out of it that they actually believe the lies. And if that’s the case, they’ve got naivete to add to their list of problems. Any parent feeding their children these vile toxins, in my not so humble opinion, needs their head examined. Either they can’t read the ingredient labels, cannot comprehend them, or they simply don’t care. The typical excuse is that they can’t ‘afford’ better food. Excuse me? That’s so laughable as to be worthy of knee-slapping. They receive hundreds of dollars a month in free food credits, and they somehow cannot ‘afford’ better food? Even the folks who are NOT on the public dole, can certainly afford better food. A little education goes a long way. If they simply educated themselves as to the reasons for obesity and the like, and changed their diets accordingly, then we would see huge swings in the obesity, heart disease, and type II diabetes epidemics in this country. But here’s the rub. They don’t WANT to change. Not really. If they did, they would. They don’t, so… they don’t. And I find that disturbing, and disgusting. These people will stay the exact same way they are until some outside force moves them to change. Literally FORCES them to change, by some alteration of rules or regulations. They’ll never, in a million years, change of their own free will and accord. Ever. It is my opinion that people should be free to eat what they want… and pay the price accordingly. We should not bankroll their healthcare. You want to eat at places like McDonald’s six times a week and/or drink yourself into a soda coma? Have at it. Just don’t look to other people to fund your healthcare when you are on death’s door. I feel very strongly about this. I feel that people need to take responsibility for the health decisions that they make, and not expect others to pay for their 40 years of excess when they ignored the warning signs and good advice everyone around them has been giving them. Posted on June 5, 2013 by Wild Cookery! I went fishing yesterday from about 3 PM to around 8:30 PM, and got home right before dark. I do enjoy the actual act of fishing, but this isn’t recreation or leisure time. This is absolutely serious ‘foraging’ time. Coming home empty handed means no meat for dinner. It’s very different from what most people I know do… going out and wasting a few hours with a pole in the water, and not caring if you catch anything or not. Heck, most people will throw the fish back if they only catch a few, thinking it’s ‘not worth their time’ to clean them unless they have a bunch. This mindset is alien to me. I fish for one reason only: food. I never, ever, fish for ‘sport’. So, I went to the first turn off instead of my usual spot. It’s a nice area, I’ve just never caught a single fish there. Ever. I’ve seen other people catch them. I’ve just not done so. It’s not a very sheltered area, and the wind whips in pretty good. Most of the folks that I’ve seen catch fish in that spot use a boat, and then fish IN towards land in the little nooks and get fish that like to hang out around the root structures and such. If I only had a canoe or kayak or some such, that’d be me. But I can’t stand motor operated watercraft. The noise and the endless disruption grate on my nerves, not to mention the fact that the gas powered motors kill loads of fish. If they banned all motor driven watercraft from this lake, I’d be very, very happy. People get a motor boat and think they’re all of a sudden uber-fishers. The first three hours I didn’t get a single nibble, using any bait. Then I got a few tiny nibbles, and it was the itty bitty fish that like to harass and steal your bait without biting the hook. 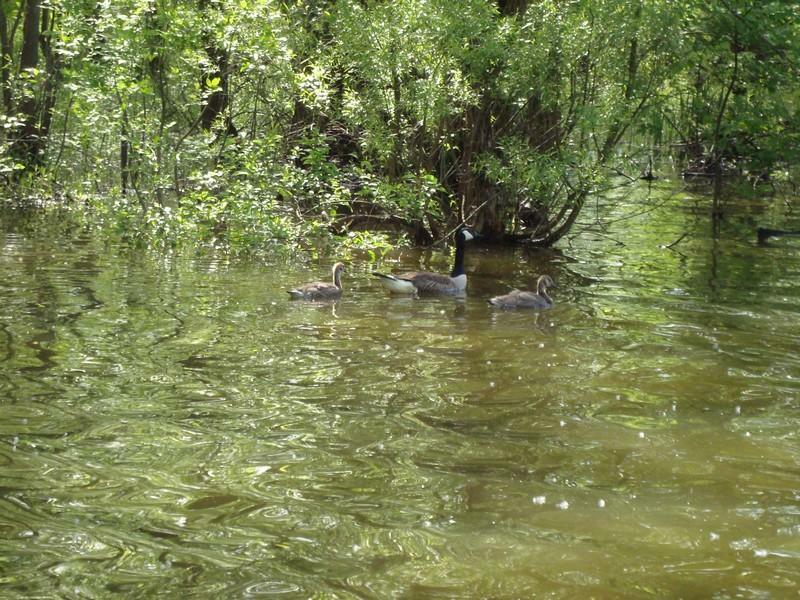 However, I did see quite a few geese. They’d pass within only a few feet of me. 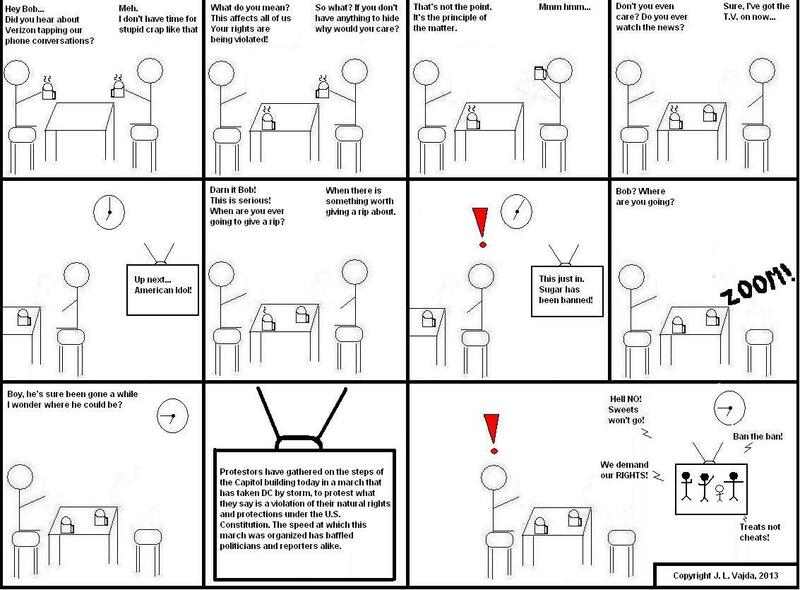 Oh damn our twisted society and it’s idiotic rules and regulations! Here, passing within spitting distance, was breakfast, lunch, and dinner on the wing. For a week. For a whole family! Thus, no goose for me. Though I’d be lying if I said I didn’t want one. I do like geese though, and not just for eating. 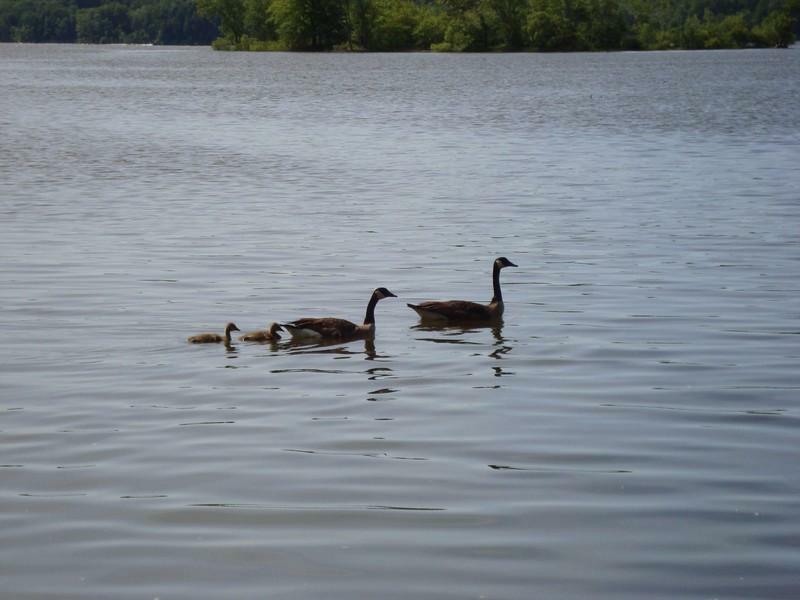 I think the goslings are cute and squeaky. I’d still eat one though. I absolutely love goose. Never had a gosling though. I think it’d be like a tender young chicken, but goosey flavored. I finally moved somewhat close to my usual fishing spot. It was a less-favorable spot (in my opinion, and for what I was fishing for) than my favorite fishing spot. It was also closer to the boat ramp, which meant that literally every 10 to 15 minutes, someone was load or unloading a boat. There was also trash littering the beach, in great quantity, and I mean that in more ways than one. Unfortunately my favorite spot was taken up by two white boys, only a bit younger than myself, who apparently thought they were inner city gangstas. At the very least, they certainly talked like it. And for the love of everything precious and good, they just would not shut the heck up! I got regaled at full volume on such topics as football, basketball, baseball, rap music, boxing, as well as listen to two supposedly best friends ‘cut’ on each other (verbally) the entire time. If there was any other decent fishing spot, I’d have moved. Such was the fun fishing next to ‘Joey’ and ‘Mario’. They were about 60 yards away and I listened to their BS for three and a half hours before they finally left (in a Lexus SUV of all things!) And, as it was getting cold and dark, I left soon thereafter. However I did end up catching 6 fish at that spot, all bluegill. 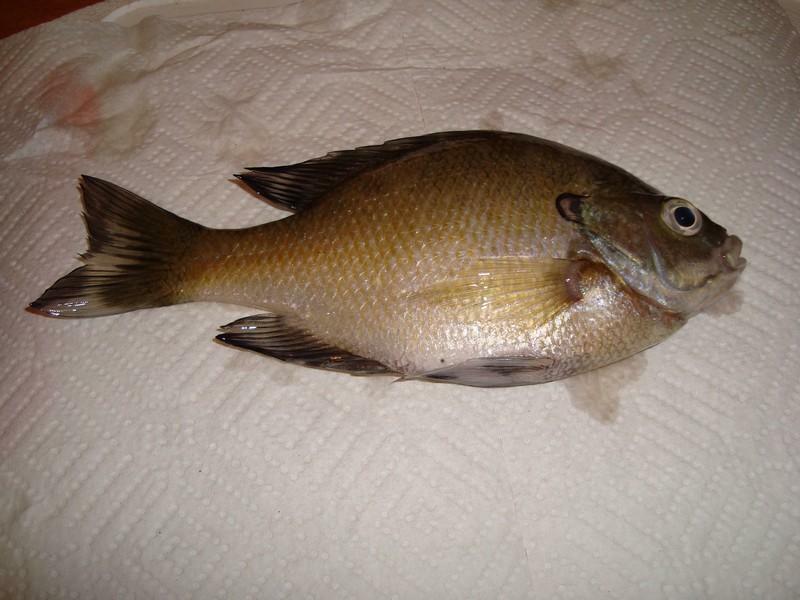 Here’s one of the bluegill I caught. It is a female. As I was leaving, a nice fellow about my age who’d been out on a boat asked me what I was fishing for, and I said ‘Bluegill’. He asked me if I wanted a crappie, as he caught only one and was going to throw it back. I said “Absolutely!” It was a very nice sized black crappie (Pomoxis nigromaculatus) I thanked him heartily for the unexpected fishy gift. Which, by the way, was the largest by far of all the fish in my bucket. Though to be fair, crappie tend to be bigger than bluegill most of the time. In case you don’t know, black crappie have black spots. 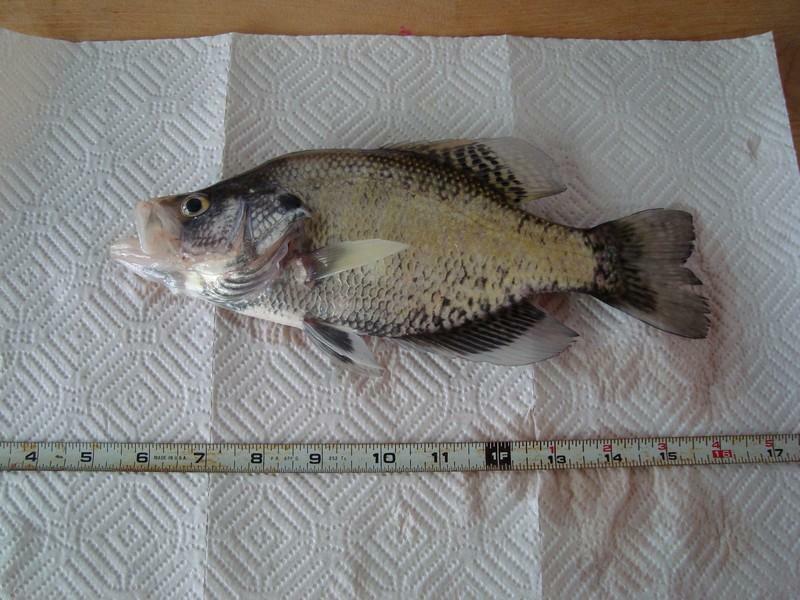 That’s what nigromaculatus means White crappie have 8 to 10 vertical stripes. Most fishermen seem to call the black crappie ‘white crappie’, because no one has explained the simple difference to them. One of the fish expired, so I cleaned it when I got home. But the others were still alive and flippy, so I left them in the big cooler overnight. Unless I’m in a hurry, I prefer to let them expire on their own accord vs having to deal with them whilst they’re all flippy. When I woke up, they were all dead on the bottom of the cooler. I expected as much. They probably expired sometime in the wee hours of the night. I put them in a bucket of ice cold water, and there they shall sit until I finish eating and typing this. After which, I’ll clean them, scale them, gut them, and behead them, and into the fridge they will go for supper tonight. Finding Arsenic in My Chicken Leaves Me Clucked Off! Posted on June 3, 2013 by Wild Cookery! Ok, I’m on day two of my path to eating more Primal/Paleo. So the first thing I look at is how to cut OUT the carbs, and how to put IN more meat. This means wiping out some of the rice and potatoes that usually make up the bulk of my main meal, and putting in more animal fats and good oils, such as olive and coconut oil. I’m on a severely restricted budget with zero wiggle room, so whatever I do will have to be an almost straight replacement dollar wise, carbs for meat/fat/oil. Well, the obvious choice seems to be chicken. It’s fairly inexpensive, compared to anything else available, and growth hormones aren’t allowed in chicken. So far so good, right? One would think so. Except that I read again the other day that conventional farms are intentionally feeding chickens toxic levels of arsenic in order to bulk them up and make them ready for sale faster. Oh yum! Apparently this isn’t just a few farms, but rather standard practice. And it’s not only allowed, but totally rubber-stamped by the FDA! And these people are supposed to be making our food ‘safe’? This has me very, very clucked off. So my real concern here is that by increasing my meat consumption, I’m going to be adding a whole boatload of arsenic into my diet. Whereas I typically eat chicken once or twice a month, and it’s probably not a big deal at those levels, eating it ever day or every other day is another story entirely. So how in the hell am I supposed to add more meat into my diet without poisoning myself?! We’re not. And that’s the point entirely. This leaves me (and everyone else), with very few viable options. It’s either eat the toxins and smile, or find a plan B. Looks like it’s time to look up my local asinine ‘laws’ on keeping and raising bunnies for personal use. P.S. Where do the rest of you cavemen get your meat from, and how the heck do you afford it?